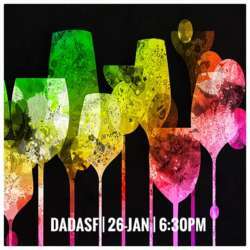 Please join Alexandra, Conyee and Hilary for a Saturday Happy Hour at the eclectic DadaSF, a beautiful Financial District art gallery/bar for up-and-coming artists to display their work. At night it morphs into an after-hours venue for parties & events, and provides a stunning space to network with friends and other expats. So, don't miss this opportunity to meet friends and mingle with other expats and global minds from all over the world! The Entry Fee is payable at the door via cash, PayPal, or Venmo. This fee goes toward covering the costs of our InterNations Events. NOTE: Albatross members pay a small subscription fee online, dedicated to improving InterNations' website and developing new features, and therefore enjoy a reduced entrance fee to the monthly get-togethers. Well worth it if you join us regularly! As always, Alexandra, Conyee, and I look forward to seeing you on Saturday, 26 January!